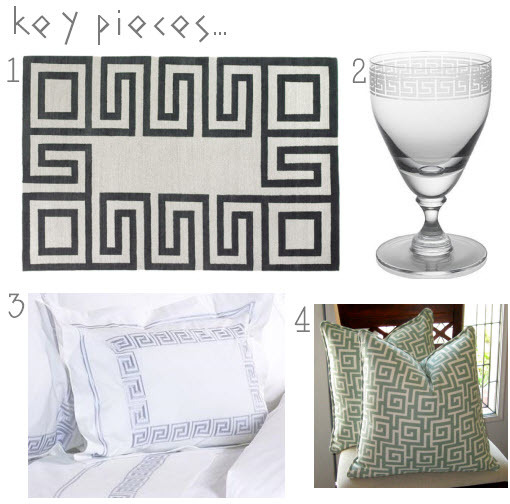 If you’re not the type who goes for floral or abstract patterns in their home decor, and you gravitate more towards chevrons and prints with more of a geometric quality, then the hot trend of Greek Key could be perfect for you. It’s a very simple and classic pattern which, added to the borders of curtains or boldly featured on rugs, can evoke an incredibly glamorous feel. I am noticing more and more pieces of furniture and accessories that incorporate Greek Key as well – I especially love the gold lamp base below, it’s so striking. Are you a fan of this motif?